Dr. Yang, What originally brought you to the martial arts? I became interested in martial arts partly because I grew up in a traditional Chinese society. I was born right after World War II in Yang’s Village, which consisted of more than 600 relatives and family members living together. Back then, it was not uncommon to see many people around you training Kung Fu. Serious martial arts practitioners and highly-skilled masters were much more prevalent than they are today. Training Kung Fu was as common as learning to play an instrument, or playing sports. Martial arts movies and martial arts street performers were also very popular. Whenever I saw martial artists performing in the movies or on the street, it made me very excited and increased my desire to learn it. Because training martial arts was so popular, my parents were not surprised that I wanted to train Kung Fu and did not oppose it. Also, because Chiang, Kai-Shek’s party was aggressively preparing for war against the Chinese Communists, there were many people who were searching for ways to condition themselves both physically and psychologically. Training martial arts proved to be one of the best ways of reaching this goal. Currently, what is your favorite form or exercise to practice and why? I am 65 years old. Physically, I have lost my potential and capability to perform external styles to a physically strong level. Whenever I get injured now, I recover very slowly. This has made me turn my focus to training softer styles and doing more internal exercises, particularly in Taijiquan and Qigong. After many years of practice, research, and experience, I often like saying that Taijiquan is just like classical music. It is very deep, profound, and endless in knowledge, feeling, and creativity. The internal arts disciplines the mind and body. They also train sensitivity to Qi and the ability to control and generate Qi. The feeling of internal arts is much deeper and harder to achieve than just about all external styles. It is a very unique and rewarding feeling because the only way to experience it is through diligent practice, and it keeps evolving into something much more the deeper you get. I enjoy the depth of this feeling very much. Internal arts is definitely my favorite form of exercise. I still enjoy teaching external styles because it helps me maintain some level of my physical strength. I believe regular physical movements are the key to slowing down the aging process, staying healthy, and keeping away from sicknesses. However, as my body continues to age, I will gradually be concentrating more and more on developing a deeper and more refined practice in internal styles only. What has been the hardest obstacle in teaching? The hardest obstacle today is finding committed students. It is not easy to find a student who is able and willing to sacrifice or compromise things such as their job, families, or social lives to sincerely dedicate to training. Kung Fu has been downgraded to a hobby or sport. Some might even view it as a luxury in today's society. Additionally, it is not easy to find a student who has the will, patience, endurance, perseverance, and morality required to train to a meaningful level. Due to the exaggeration of martial arts in the media today, just about all students have fantasies about how good of a martial artist they can be in a short period of time. However, any deep art takes a lot of time and patience (Gongfu) to reach an accomplished or exceptional level. Fantasy and reality have been mixed in today’s world. The “McDonald's” culture of getting what you want fast, cheap, and at a low standard has influenced all of the young generation. So many young kids only want a quick result and do not train as seriously as the generations before them. The idea of diligently training to enjoy the rewards of working hard is virtually nonexistent. Many young kids do not want to train hard but still want and expect the rewards. From what I can observe, the feeling, understanding, and depth of traditional martial arts today is missing in a majority of practitioners. Many students do not stay with their training for a long period of time, especially when they get new jobs, go to college, move away, get a girlfriend or boyfriend, get married, or have kids. Sometimes students lose interest or make excuses because the training is much harder than they originally expected or wanted. Kung Fu is a passing interest to most people. Generally speaking, if anyone is looking for fast results, no teacher is required. There is very little instruction or guidance needed for learning quantity. I have seen a lot of teachers only in their 20s who practice more than 10 styles, often mixing several of them together. It is not difficult to do this with a strong interest and persistence, especially when there are so many instructional DVDs available today. To learn even just one style to a true level of mastery, however, will take much more than just DVDs and much more than just a few years of training with a master. For example, there are perhaps thousands of people who know how to play the piano very well, but there are much fewer Beethovens and Mozarts in the world. I believe in achieving a high quality of mastery like Beethoven, and not just achieving a level that is only above average. Due to the fast development of material science, many people today are also constantly searching first for materialistic pleasures and enjoyment. Cultivation of the spirit has been downgraded significantly since the middle of the last century. Many people are more concerned about having fancy cars, big televisions, large mansions, or expensive jewelry instead of core family values, respect and kindness towards others, and a coherent desire to make the world a better place for humanity. This has made the process of teaching about the internal arts, Qi, mind, spirit, and life much harder than before. For example, it is very hard to teach many people to meditate today. There are so many distractions in the material world, and many people are just too accustomed to looking for shortcuts. Have you had to deal with personal threats or "challenges" over the years? If speaking on in particular, how was it handled? One time, there was a drunk guy who came to YMAA Boston to challenge the school. I did not believe he really wanted to fight, and in the end, I was right. He began by talking a lot about how he fought in the Vietnam War, how he had overcome many challenges won many fights against other people. I listened to him and nodded my head. When he realized I was actually listening, he calmed down a little. I told him that I was in the middle of a class and said that if he wanted to fight, he would have to wait until my class was over. He sat down. I gave him a cup of strong coffee. When I finished teaching my class, he was nowhere to be found. All I saw was an empty coffee cup on his chair. From then on, every time he walked past the school, he would always raise up both of his hands and wave to say hello. We became friends. There were a few times where I was able to dissuade others from challenging us simply by inviting them to tea or coffee. Oftentimes, after getting to know each other, there was no fight. I believe that most people are not bad, and sometimes it just takes a little bit of work to get to know somebody's true intentions. Sometimes people just come across some rough patches in life. I understand that very well from my own experiences. The worst challenges that I had to deal with were when I was attacked by people who only had the intention to harm or conquer me. In my earlier years of YMAA, sometimes people would just walk into my school and interrupt my classes or seminars to cause trouble. There were multiple times when I was invited to teach a seminar but was instead challenged, once by a long line of people waiting to push hands with me. Many were just interested promoting themselves, and only wanted to be able to say, “I beat Dr. Yang.” There was no chance to show courtesy or establish friendship in these situations. That is why you must be alert when someone approaches you with a hostile attitude. If you have good awareness and alertness, you can easily sense when such a situation is coming and react appropriately. The outcome is always dependent on how good your reaction skills are, your strategy and assessment of the threat (if any real threat is there), and how effective the techniques you use are. In many cases, I was able to just walk away, regardless of how upset the other party was. Sometimes all that is required is a calm mind and a well-strategized approach. I still believe that the best fight is no fight. In today's modern day times, physical confrontation is usually not necessary, and that is the option I always seek first before all other solutions. When I first started publishing martial arts books, I also received a number of very upset letters, some from other masters, scolding me for revealing a lot of secrets from ancient Chinese documents. I simply wanted to share the knowledge with the world. After seeing how much knowledge my White Crane master was unable to pass on before he died, I felt a duty to preserve as much martial arts knowledge as I possibly could. To me, translating these documents and publishing them was the best way to reach the world, and to have a well-documented record of them in the future. In today's world, I see no need to keep secrets. So when I first started publishing, very conservative masters did not agree with me, and they were in fact, very angry at me. However, several years later, some of those that initially scolded me eventually apologized, saying that what I was doing was actually the right thing to do. After so much time had passed, like me, they realized that the traditional arts were dying. The true essence of the arts is being lost exponentially from generation to generation. Without being open about sharing this knowledge, the essence will be completely lost in just a few more decades. I always wish that I could do more to preserve and develop the art because I have really just barely scratched the surface. There are so many more documents that still have yet to be translated, and unfortunately, so many more that were lost during the Cultural Revolution. Kung Fu is not what it used to be. Students are far less committed and dedicated than they were in my generation, and even then, in my generation there were still some problematic students. It makes me sad to think about how many hundreds of years of knowledge were simply neglected or thrown away because society has devalued Kung Fu and become distracted from knowing the real quality of human life and spirituality. I hope to educate the public about how it has benefited my life and the lives of so many others, and how it can also benefit them. The "mixed martial arts" are very popular these days. 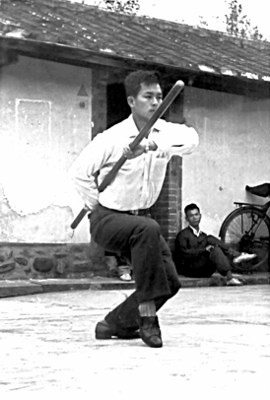 Why do you think that "kung fu" is not prevalent? MMA is very mainstream and heavily promoted. I believe this is because it generates a lot of business and money in the entertainment industry. It is similar to boxing or the gladiator battles in the old days. These types of events draw a big crowd. Many people instinctively like cheering for a team or a celebrity. Unfortunately, in such sports, oftentimes people are interested only because of the violence, name, or competition. Since violent events and media coverage such as MMA influence much more people than traditional training, I feel that the overall feeling of martial arts has become so shallow. We are accustomed to the ideas of wanting to overcome adversity, to push ourselves to become better than others, or to have “good vanquish evil.” But respectable deeds and struggles do not involve unnecessary violence or belittling others for the sake of entertainment, whether in a full-contact activity like MMA, or a no-contact activity like golf. Kung Fu stresses these values much more than MMA. It is unfortunate that fighting sports like MMA encourage and support the ideas of conquering and intimidating others through violence, and it seems to prioritize getting titles. MMA can be trained in a proper way when it is with the right goals and intentions in mind. I truly believe that not all MMA fighters are only interested in violence and glory. Conversely, not all traditional practitioners are always training for righteous reasons. It is the mind of a person that makes the difference; the art being trained is irrelevant. I believe there are some MMA practitioners who will spend their time patiently to truly comprehend the arts and experience its deep feeling. However, it seems that mainstream MMA just focuses on the wrong things about martial arts training. In traditional training, a Kung Fu master will not teach a student any fighting techniques until they have built enough trust and confidence in the student's ability, responsibility, judgment, and moral character. Unfortunately, I believe this is why many fighting schools often criticize Kung Fu. There are no immediate results, like winning fights, in traditional martial arts. It is true that many traditional students never reach a stage where they can really apply the techniques they learn. However, fighting has never been the goal of traditional training. Traditional martial arts has always been for self-defense and self-cultivation, never for fame, glory, power, name, or money. Fighting ability in traditional martial arts is related to how much students can develop their mind first, and in addition to that, how much they truly want to be a fighter. I find that just about all traditional teachers and students always promote nonviolence and peaceful ways. In addition, the traditional martial artists that do develop a high level of fighting often do not show it off or publicly display it. The skill set they develop is always just for their own personal goals and development, never for others. In order to get to a high level of martial arts mastery, Kung Fu can be trained in no other way. Kung Fu is a traditional art, and it has persisted over hundreds of years and generations because of the values it promotes. It takes time, patience, endurance, perseverance, and high morality. In most cases, if students have such qualities, they are not looking to win matches, to get a title, or to promote themselves. Traditional schools often train their students first in fundamentals: basic stances, basic hand forms, basic body mechanics, basic coordination, and very importantly, martial morality and the mind. They are much more demanding in terms of requiring concentration and discipline of the mind. This preliminary training alone can take years. Many beginning students give up or lose patience in traditional training because of this, especially the ones that only want to fight. I believe the mentality of wanting to learn martial arts only to fight is still more popular than learning martial arts for self-cultivation. Even when I began martial arts when I was 15, I had only wanted to learn how to fight. MMA is more popular in this respect because they enter into sparring training much earlier. Externally, the results in MMA are more easily visible and can be trained relatively quickly. It is easy to see when a person is bigger, faster, or stronger and can take somebody else down. I believe MMA is popular because this is what many students want today. These students are only searching to become better than others and getting fast results. Earlier I referred to this as the “McDonald's” culture, getting things quickly, easily, and just to the point of satisfaction. MMA is well-suited for those who are looking for fashion and quick results. The good side of MMA is that the body conditioning program is very rigorous and an quickly form a strong foundation for deeper training. Many traditional schools often do not stress enough body conditioning in the beginning, as they are not learning how to fight in just a few months time. In MMA, the highly competitive environment also motivates students to constantly push themselves harder. This helps students make themselves better by always pushing their limits and always striving for improvement. It is only when MMA becomes more focused on winning and bettering others that I dislike it. I believe that there are many students that eventually leave MMA to train independently on their own path. After a certain stage in MMA, I believe that winning matches and titles becomes the only goal. To me, succeeding in competitions like those in MMA can be steps in the process of your training, but it definitely should never be the goal. I also do not favor MMA because there are many rules in the ring that do not apply outside on the street. Any complete martial arts system will never be based in sport combat. How effective your practice ultimately is will be up to exactly how much you train, what you train, and for what purposes. I wish that the traditional arts would get some more attention. Otherwise, in a few more generations, we will truly lose its essence and original purpose. It is much more difficult to find people who can appreciate Kung Fu for what it really embodies as a whole. The results of Kung Fu training take much longer to see, oftentimes taking 1-2 years minimum to get a feel for the art, 5-10 years to discover it, 10-20 years to explore it, 20-40 years to develop it, and a lifetime to perfect it. Only after the mind has been developed can the techniques be properly learned. Learning a lot of techniques with no foundation and no root is very shallow and void. Developing the art to a truly deep and meaningful level takes a lifetime of dedicated training and a clear mind. It is a journey without an end. However, nowadays much of this generation do not have many of these qualities, and what is worse, is that they do not seek them either. That is the reason I began the 10-year program at the YMAA Retreat Center. I have been training a small group of students at this center full-time since 2008. The students train about 8 hours everyday, 9 months out of the year, and they live independently at the center. I hope that from having this daily, rigorous training routine, they will develop the attitude and characteristics necessary to last until the end of the program, to become good martial artists, and to become good people. What is your primary teaching message? or in other words, what do you hope your students understand from your teachings? Art takes a lot of time and the right mind to truly appreciate and enjoy. Many things we do in our everyday lives and careers can be considered very complex and beautiful forms of art. Whether it is martial arts, music, writing, painting, engineering, speaking a language, healing and helping people, playing sports, playing chess, or whatever we concentrate on and dedicate ourselves to, the development and true feeling of the breadth of each art-form can only be felt when practiced diligently, with discipline, with humility, and with the right intentions. Without these things, the art you practice will always be only on the surface. You should continue searching deeper and deeper into your practice. Keep finding resources and people to learn from and help lead you. Don't get stuck in the same spot. What you will discover is so rewarding. Keep your cup empty and you will always see the beautiful horizon ahead. If your cup is full, then there will be too many clouds obstructing your view. I began training martial arts because I wanted to fight, but from that time until now, after more than 50 years of practice, it has evolved into something so much more. How does one develop Qi properly and safely? Of course, you must first understand the core theory. There are plenty of good books which can provide you with this information, but I do highly recommend learning from a teacher in person at the very beginning, and when you enter the more advanced stages of training. Oftentimes, even after a simple and short session with an experienced practitioner, you can get on the right track. There are many pieces to the puzzle that you will better understand through in-person teachings from an experienced instructor instead of just from publications. This will save time, give you a clearer direction, and prevent you from engaging in any harmful practices. Once you understand the theory, you can learn from many available Qigong publications without danger. Generally speaking, most Qigong practices and exercises deal with External Elixir and are not dangerous to practice if done incorrectly. However, if you wish to learn deeper aspects of Qigong, especially Internal Elixir, then you will need to be very confident in your Qigong knowledge, your control and feeling of Qi in your body, and the discipline of your mind. Otherwise, advanced levels of Qigong can actually be very harmful to your body and health if it is practiced carelessly. At this stage of the training, you will need a qualified and experienced teacher to lead you on the right path. Naturally, you must still be cautious. Take your time and don’t rush if you are not sure. Is there a difference between practicing Qigong for health & practicing for martial ability? Yes. Medical Qigong was developed more than 2300 years ago. The goal was to maintain health and promote healing of the body, in yourself and others. Martial Qigong was developed around 500 A.D. when Bodhidharma was in China. Martial Qigong was developed from Bodhidharma’s Muscle/Tendon Changing and Marrow/Brain Washing Qigong classics. The primary goal of Martial Qigong was to enhance the power manifested from the physical body. This was a crucial factor in winning a battle during wartimes. Through Martial Qigong, specific training methods such as Iron Shirt, One-Finger Meditation, and Iron Sand Palm were developed. These methods significantly helped to increase the body's physical strength and fighting capability. However, in today's generation, we no longer need to train such extreme methods of physical conditioning such as Iron Shirt or Iron Sand Palm. In fact, it was discovered that such training can actually be quite damaging to the body, especially as the body ages. Such extreme forms of conditioning can contribute to nerve damage, arthritis, and high blood pressure in older people. I do not believe that Martial Qigong should be trained today for developing power to fight. I believe it has more purpose in simply conditioning the muscles, tendons, and joints to make the body stronger, and to train the mind. In this respect, practicing Qigong for health and for martial ability are more similar, because health is the goal in both. The goal of all Qigong practice today is really more about longevity, health, and cultivation. 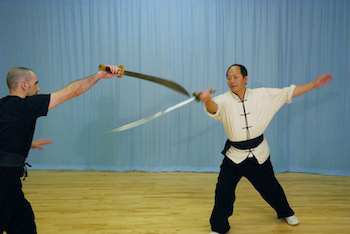 Martial ability was the original intent of training Martial Qigong during wartimes, but we cannot expect that any level of Martial Qigong will defend against a bomb, a bullet, or chemical warfare. We expect to live much longer in modern day compared to those people in the past, so we need to age gracefully. Thus, Martial Qigong should be trained with care, and with the goal of health in mind, not with the goal of simply developing brute physical strength. Briefly inform us on the success of your "Kung Fu Retreat." We have had many ups and downs in these first four years of the program at the YMAA Retreat Center. I do believe that overall, the program is successful so far. It is on schedule and progressing as expected. The program and the students are stable, and we are now steadily making headway into the curriculum. Of course, it has not always been picture perfect, and I do expect more challenges down the road. There have been many obstacles already. First of all, I was hoping that we would gain more momentum in financial support by the second year. However, after more than 3 years of being in operation, my seminar income is still the primary means of supporting the center. My hope is that the center can be self-sustaining one day so that it can stay open after the training program finishes in 2018. Our costs to keep the center open average about $80,000 - $100,000 every year. Second, we encountered visa problems for our foreign students. Foreign students were unable to stay for entire semesters until we had approval from the Student Exchange Visitor Information System (SEVIS). SEVIS approval is required for foreign students to apply for I-20 student visas. It was not until after three years of applying and paying many fees that we were finally approved. Part of the reason it took so long was because the first time we were about to receive approval, the California department handling our case was dissolved and not reestablished until two years later. We had to apply again from scratch. Unfortunately, one of the students from the first group was forced to go back to Portugal because of this. Third, several accepted students were unable to endure the training. This was expected, because as I explained above, it is very difficult nowadays to find sincere, dedicated students who are searching for more than just fashion or quick results. However, I did not expect that the student retention rate would be only 30% after three years. This means that for every six students that I accepted, two of them either abandoned the training or were asked to leave. It is not easy to find committed students in this society. Although I was disappointed when students left, the good side of this is that semester by semester, we have been filtering out students who were not really serious about the training. This has left behind a stronger, core group of students, which is very important because the students ultimately are the foundation to the entire program. Without a dedicated group, the program will not finish successfully. This filtering process has also helped us design our revised application and interview process for potential students in the upcoming 5-year program. I would like to recruit another group of 5 to 6 students to join us for the last 5 years of the current program. We have only 4 students here right now, beginning from about 13. There are already a few applicants with good potential who have expressed their interest for this new program, and many of them will visit the center this year. If anybody is interested in applying, please visit the web: http://ymaa-retreatcenter.org/full-time-program/5-year. I would not say the program is 100% successful, but of course it is expected that there are bumps on the road. Right now, the current students are behind in terms of following the originally scheduled curriculum. However, the quality of training has actually been satisfactory. For what I expected, the students are at about the right level for having trained full-time here in the mountains for 3 years. I believe that as long as the students have quality, learning more quantity is trivial, just a matter of time and practice. Quality is always much harder to achieve than quantity. The quality of training offers you a deeper feeling, which in turn gives you the capability of creation. I prefer to one day have a student who has the quality to create one deep style instead of ten students who have only quantity and create one hundred shallow styles. Now that the students at the center have established their fundamentals, I want to push them to achieve even more in the second half of the program. What do you hope to accomplish in the upcoming (5-10) years? As I mentioned earlier, I hope to find 5-6 more committed students for the upcoming 5-year training program, which will begin in September 2013. Before I retire, I want to teach as many sincerely dedicated and committed students as I can to the highest level possible, through this program and the environment at the center. My goal is to provide as much as I can to these students such that they can continue developing their training and techniques independently on their own after they finish. I believe the current group I have now will reach an acceptable level of quality in their preliminary training after one or two more years. Once they have this quality, they will be able to pick up all of the quantity of what I have learned in the past. Building this foundation of quality at the very beginning is crucial to the success of the students. It is necessary to be able to properly learn the quantity portion to a good level of depth and understanding. If I had taught quantity first, everything the students would have trained up to this point would have been very meaningless, just a bunch of techniques that may look pretty, but have no foundation, root, or practical applications. The foundational training is what is neglected at so many schools today, and that is what I hope to provide and enforce in the full-time training programs at the center. My ultimate goal is to have all graduates of the center become confident, well-educated, and exemplary in the traditional ways of training. I also hope they are able to reach a high level in their fighting skills, fighting strategy, and situational awareness, as I believe that will exhibit their depth and understanding of martial arts overall. My goal is to train a group of masters instead of students. In order to become a master, one must have a deep feeling of the art. This can only be achieved through experience, experience obtained through a rigorous and strict training regimen. The graduates of the center must have knowledge that is beyond the understanding of the average martial arts instructor. Only then, can they be a creator of new skills. Remember, arts are creative, and this creative capability can only come from a deeply rooted feeling, history, and experience with them.